I went into pregnancy and labor with an open mind, I held onto any ideas or expectations I had with a very loose grip. I knew I wanted to aim for a natural birth, I even went out of my way to go to one of the only two hospitals that allows water births. With that said I was also very open to and okay with the possibility that all natural just might not work out. Most of the people around me have gone the drug free route, so I knew it was completely possible and not too crazy of an idea. Well spoiler alert... I pretty much ended up having every kind of medial intervention possible, even beyond what is normally a part of labor. I was healthy throughout my entire pregnancy, other than really excessive swelling (I am talking not being able to wear real shoes for three months). At my very last prenatal appointment my usually low blood pressure was pretty high. My midwives ran some various tests and found out I had preeclampsia, so they called me into the hospital to be induced. That definitely was not an option that had ever crossed my mind so I was pretty nervous. On the way to the hospital late that night Patrick and I stopped to have a last meal of Burgerville and delicious pumpkin milkshakes, which we ate in the car in the hospital parking lot. That was pretty fun. We checked into the hospital and the midwife got started right away to get that baby out of me. Well that night started a five day long adventure of cervadil, pitocin, more cervadil, more pitocin, more medications I'd never heard of. Yes, it took me five days to be induced, my body just wasn't ready. 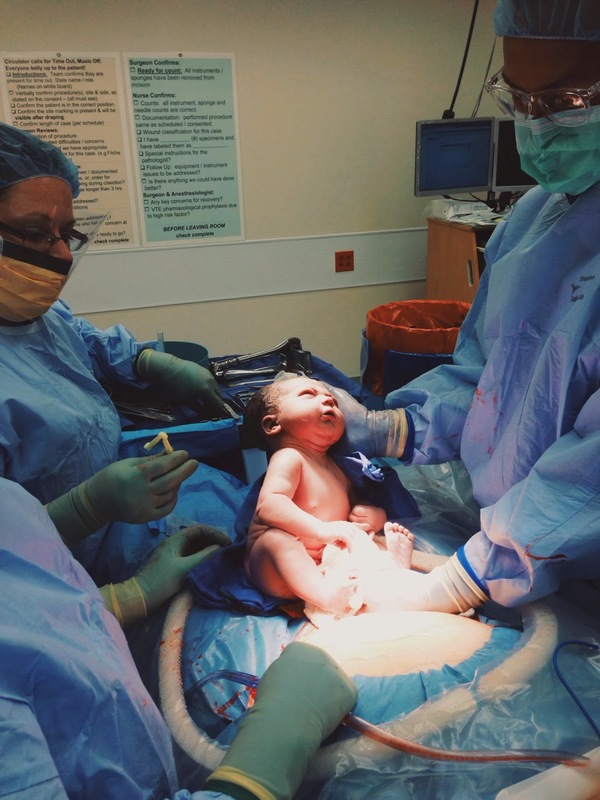 I was adamant about not having a c-section and my midwives were more than on board to help me avoid that route. I am very stubborn and saw no breaking point anywhere in the future and I am so fortunate that I had a team of supportive midwives who were also stubborn and not ready to give up. Well after five whole days and being dilated one whole centimeter they decided to break my water. That did the trick, finally later that night labor started! By the time labor started I was pretty exhausted and also had to be put on a medication that prevents seizures when you're preeclamptic, but that can make you feel pretty crappy and sickly. So when the first pitocin induced contractions started I demanded an epidural. Over the next 20 or so hours of labor that epidural quit working more times than I could count so it was not a restful 20 hours in any way. Finally it was time to push! The pushing part always sounded like the worst thing ever, but when I was finally allowed to push... holy cow was that relieving. The pressure and weirdness of not pushing is the most uncomfortable feeling. After one push my midwives face lit up, followed by "woah! you are GOOD at pushing!". Remember this is with an epidural that went in and out, so I was very aware of everything happening. Well after almost three hours of my excellent pushing (enough for Patrick to shout "she has hair!") my midwife extremely reluctantly said she might have to bring in a doctor to look at the possibility of forceps or the vacuum. He came in and just shook his head and said that wasn't an option. My midwife looked so disappointed, we had tried everything possible. At one point, to try and help speed things along, I heard "Well, its time for a little midwife magic" as I saw two hands reaching towards me to do who knows what, in who knows where. I knew what was coming next. The doctor and midwife both explained to me that my pelvis was just too small and the baby wasn't going to fit, even with hours more of pushing. By then I was willing to do anything, so they prepped me, handed Patrick some scrubs, and wheeled me off for a c-section. It all happened so fast I didn't really have enough time to process the situation and be too scared. The surgery went smoothly and so fast! Once they start they hand you a baby in about three minutes. I should add that Patrick handed me a little girl with the longest eyelashes to possibly exist on a newborn. I should also add she was only 7 lbs 14 oz, so not a baby you'd think would be too big to birth! I know there is the idea that you just can't make a baby too big to fit, but bad and cruddy stuff happens everyday and I think this was just one of those bad, cruddy, and unfair things. So... great story, right? I wish that was the end. The morning after the crazy hubbub the night before, I felt really short of breath. After considering the possibility of an anxiety attack (which I've never had before), a chest x-ray showed fluid around my lungs. They put me on a little oxygen and gave me a medication to draw out the extra fluid. We were transferred to our recovery room and everything was back to normal. That next morning around 3 AM (after giving in and taking an ambien because I just couldn't sleep) I REALLY couldn't breathe. I didn't even have enough lung power to talk at an audible level. I was rushed down for a ct scan, which showed a LOT of fluid around my lungs. I was then wheeled off, away from Patrick and my brand new baby, while being told I was "drowning in my lungs", to stay in the ICU. So not really what you're expecting to happen after labor. The entire time everyone around me was reassuring me that I wasn't that sick and would be fine, they could just take care of the problem a lot faster in the ICU. But delirious me, no sleep in days, hopped up on ambien, wasn't hearing any of that. So it was a pretty traumatic moment. Over the next day and a half Patrick and the baby came to see me as often as possible, but that was sporadic between the echocardiograms, chest x-rays, oh and SLEEPING finally. I was then cured and moved back into the recovery room, where Patrick and the baby had been squatting because the nurses were kind enough to "lose" paperwork so the baby didn't have to be discharged and have no room to stay in. A few days later they finally sent us home and all was well. A few weeks later I brought myself into the emergency room over the weekend because of what I thought was a pulled muscle or pinched nerve in my side. That would've been way too simple. It turned out to be fluid around my right lung, so I was admitted to the hospital. My gigantic team of doctors eventually reasoned that I probably aspirated something into my lungs during labor or the c-section. The first night they stuck a giant needle in my back and drained off a liter of fluid. The lung can re-expand once fluid is removed and I was told it could be a little sore feeling. Well the instant the fluid came off it was one of the most painful experiences of my life. Like I am talking yelling and not being able to move. That procedure didn't take care of the problem, so days later it was done again (with me very drugged up) and this time they left in a tube to help with the draining. That didn't work. So days later they decided I needed surgery. Yes, surgery on my lung! I was told the surgery would be minimally invasive, depending on what they found in my lung it was possible I could wake up with like a 5 inch long incision. So going into surgery was a little bit nerve-wracking. The surgery went great and the minimally invasive option worked! It also turned out that scar tissue had tethered my lung to my diaphragm, which explains all of the extreme pain. I spent the next couple days with an even bigger chest tube than the first one. But it did the trick! After 12 days in the hospital, they took the tube out and sent me home. I felt pretty beat up for a few days, but a week later and I am feeling great! I would like to point out that the entire time I was in the hospital, Patrick took charge and became super dad. He and the baby would come visit me in the day, but other than that he was in charge. Everything went so well, barring one incident of trying to change a fussy baby while a fussy dog with stomach troubles was desperate to go outside... and didn't make it. All of that to say he is awesome and because of all of that knows a lot more than me about this baby stuff. So let's just say labor was not at all what I expected. But who expects 22 days in a hospital over the course of 5 weeks, preeclampsia, pulmonary edema, plural effusions, and finally lung surgery. I came out of it with a healthy baby, a super dad husband, and a furry dog all waiting to snuggle me as much as possible. That ends the really weird story of how a certain little girl came into the world. Remy Alice Porter, you were sure worth all of that trouble and a whole lot more. What a harrowing experience! Major props to both of you for coping so well. I hope the future holds some much-deserved R&R. What a story! I just can say that I am also very glad to hear/read, that you (and the rest of your family) are okay now and that everything went to a good end! I wish you and your family a good and healthy future, with lots of great moments together! oh my goodness! You are stronger than me, I would have been anxiety ridden the whole time! Gosh congratulations, I hope everything is going great now. What a story, what a blessing! Oh my goodness Vanessa, I'm a little late to the game but this is the craziest birth story I've ever read! I am so glad that you and Remy are doing better, I have loved getting little peaks of her on your Instagram feed. Such a beautiful babe. Wow! I too had preeclampsia, but I was at 37 weeks exactly when they induced me, so my body was much more ready to go into labor. How many weeks were you? It's good you had that loose grip on your plans for labor. Remy is healthy and beautiful, so job well done! Wow, what an ordeal! I'm so glad that everything worked out for you and the baby! Holy moly!! This is an incredible story!!!!! how are your lungs feeling now? birth is so crazy and trippy, i feel like once we go through it it's like "ohhhh so that's why birth used to kill lots of women back in the day." you must be incredibly strong and brave and your baby must be pretty powerful herself! they never found out why the fluid kept going around your lungs after the birth? many blessings to you and your beautiful family.